This is an impressive bubbler. This design resembles the Hydrant, but with multiple percs. 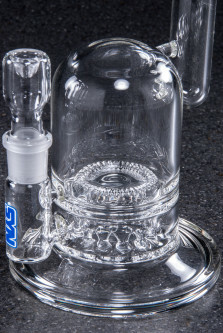 The domed body and offset mouthpiece are unique, and the Thunderdome perc inside makes this a high diffusion, low drag, freaking incredible tube. The design allows easy use, as the tube does not to be balanced under the user to keep it level. This is our bestselling high end bubbler.